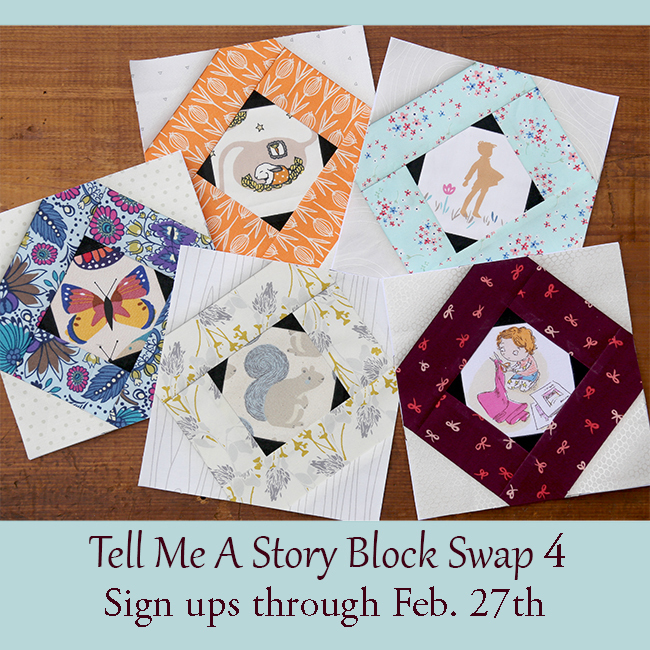 You are invited to join the Tell Me A Story Block Swap 4! We are still having so much fun and I am getting requests for more, so, here we go again! Why swap? 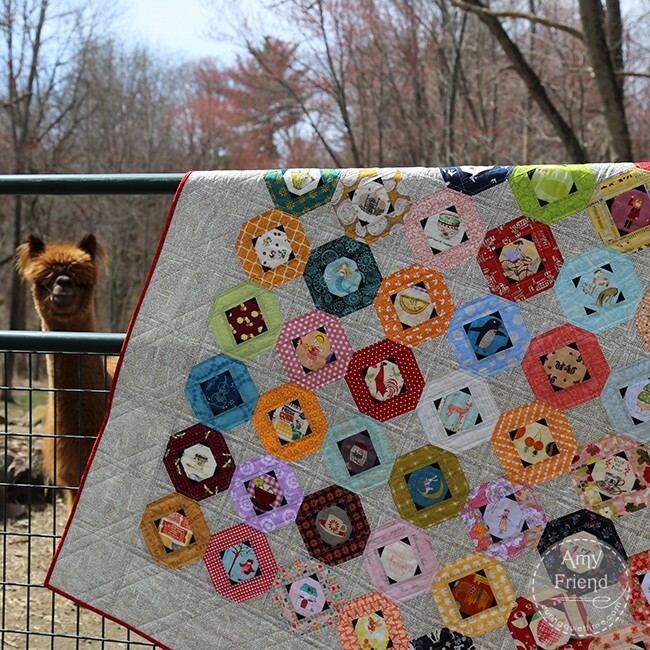 Well, if you are working on this quilt, you quickly find yourself running out of fussy cuts from your stash. By swapping, you will receive a variety of fussy cut blocks to include in your quilt top. You also meet new quilting friends from all over the world and have a reason to run to your mailbox! 1. You must purchase a copy of my book, Intentional Piecing, in order to get the Tell Me A Story block pattern. Signed copies are available in my Etsy shop with free media mail shipping to US customers. You can also find my book on Amazon (this is an affiliate link), or at your local quilt shop/book shop, or your town library. The block pattern cannot be purchased independently due to copyright reasons. Please remember that it is against copyright law to make copies and distribute them as well. This little bunny is all snug in his burrow and dreaming of the recent successful harvest. The fabric chosen for the outside border is a great fall color, and shows plants, representing his harvest. It’s that easy! I would love it if you would share pictures of your blocks and tell their stories on Instagram using the hashtag #tellmeastoryblockswap. If you do not use IG, that’s ok too. It is not required, but it might be fun to share your stories with your partners when you send your blocks. 3. The fussy cuts should be modern fabrics or quirky Japanese prints. 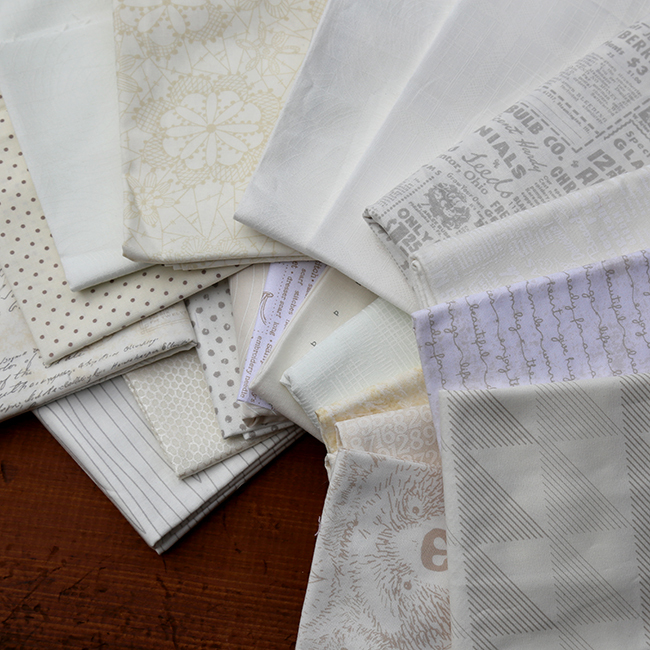 I suggest Cotton + Steel, Art Gallery Fabrics, Heather Ross, Lizzy House, Riley Blake, etc. Avoid children’s novelty prints (cartoon like, babyish, primary colors, licensed prints–stay with the more modern aesthetic). 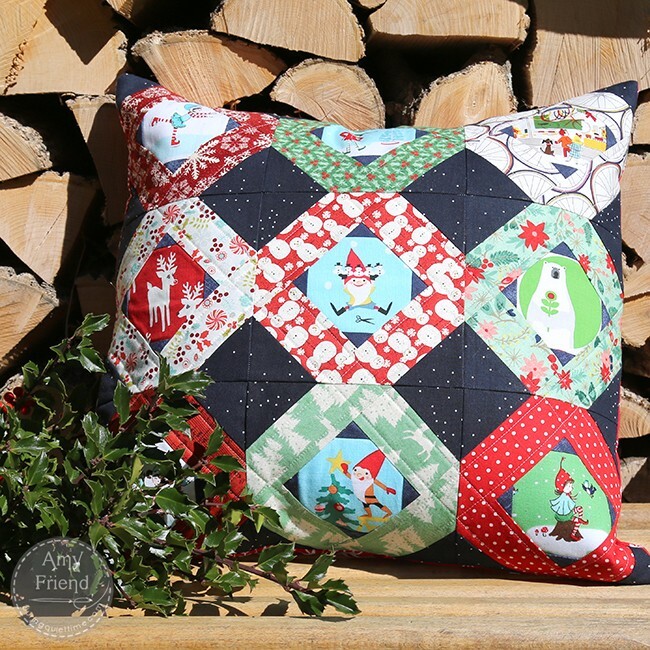 Please try to find fabrics with this look so that the resulting quilt tops hold together with blocks that have the same feel. 4. The inner triangles must be pieced in black. You may use any quilt shop quality fabric but it must be a solid black. 5. The borders can be any color to coordinate with the fussy cut, but should tell a story as described above. 6. The outermost triangles must be what I call “way low volume” fabrics. Here is a photo of what I mean. The fabrics should be white or off white and any print must be white, light beige or light gray. I don’t want any colors added in these triangles. 7. Make sure that you photocopy your foundation pattern at 100% so that it measures 6 1/2″ square unfinished (including the seam allowances). 8. Please press well between each step so that your blocks are well sewn and will fit together well with the other blocks. Creases and folds in your fabric can make it hard to piece the blocks together. 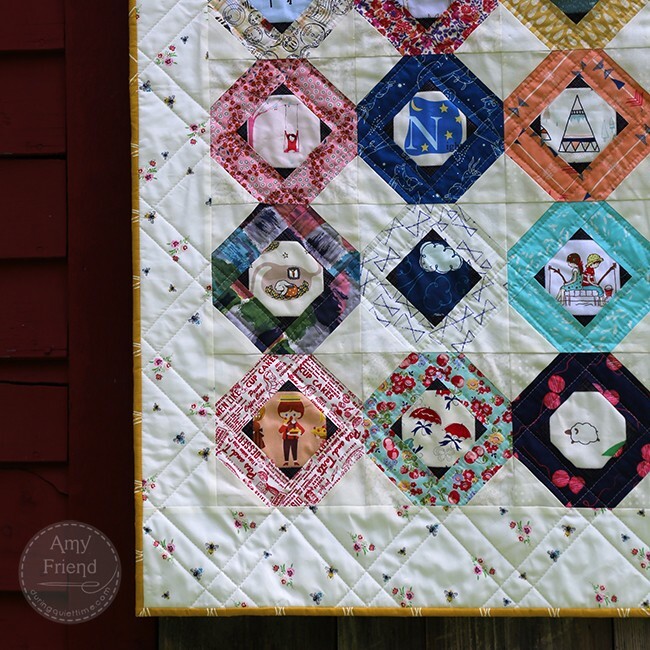 It’s my hope that by sticking to these guidelines, the finished blocks will work together beautifully in your quilt top and you will have such a great assortment of fussy cuts to round out those found in your own stash. You will be assigned to a group. The number of groups will depend on how many participants we have. Each group will include 10 people. By Round 4, I can no longer attempt to avoid matching you with previous swappers so you may have repeats in your group from previous rounds. Everyone in your group will receive your mailing address so that they can ship to you directly. 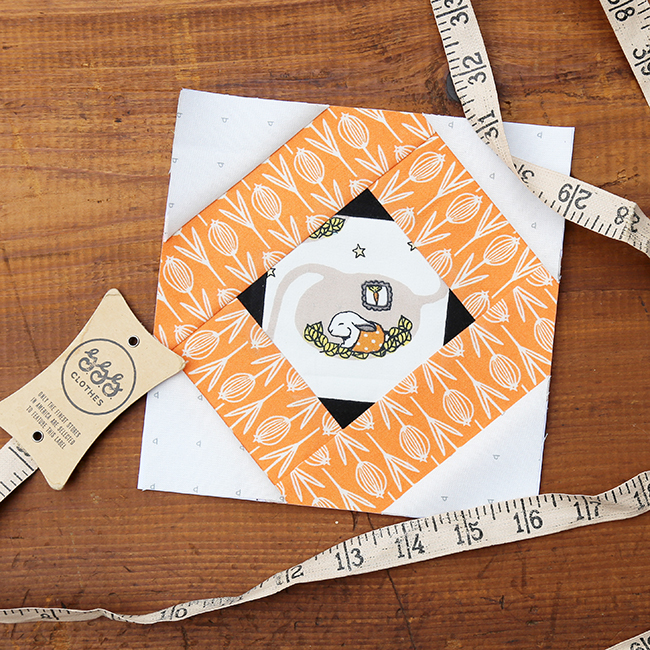 You will sew a total of 20 blocks and send 2 to each person in your group (keeping 2 for yourself!). You can either make them all different, or you can use a single fussy cut/fabric combo for half the blocks and another combo for the other half. You just want to make sure that you send two unique blocks to each person (in other words, not two identical blocks). You may be required to ship internationally. In order to keep shipping costs low, and to allow international participation, we want to be able to mail as a first class letter. This should be possible if you just send the two blocks in a note card. If someone has the means to send extras and wants to, it’s ok. But it is not expected with this swap. It’s supposed to be inexpensive, quick and easy! You must email me when you ship to your group. It’s just about accountability! I want to make sure that everyone sends so that everyone receives. If your swap members do not receive blocks from you, you will be asked to resend. You will receive your group assignment by March 3, 2019 via email. You must ship by April 1, 2019. Please do your absolute best to meet this deadline and to be fair to your group members. You may ship early! If you joined a previous round and did not send your blocks, you will not be allowed to participate in round four. To sign up, please complete this short form by February 27, 2019. Let me know if you have any questions and I will answer them here, in the comments, for everyone’s benefit. Yay! Let’s get fussy cutting!! Here are some images of Tell Me A Story projects I have made. Just remember, they do not conform to the guidelines above. Just nine blocks make a great pillow. You will receive 18–that makes two perfect pillows if you don’t want to make a complete quilt. These blocks do conform to the guidelines of the swap. You can see how I added a border that includes a little dash of color but still blends well with the off white and white outer triangles of my blocks. This quilt was made crib size. Here’s my original from the book. Check out the hashtag #tellmeastoryblockswap on Instagram to see all the amazing blocks that are being made! Remember, you can start sewing as soon as you sign up if you’d like! No need to wait!